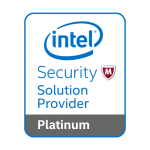 Intel Security combines the experience and expertise of McAfee with the innovation and proven performance of Intel to make security an essential ingredient in every architecture and on every computing platform. Across smartphones, tablets, PCs, servers, and beyond, we’re moving security from discrete solutions to an integrated approach as pervasive as computing itself. Intel Security’s mission is to give everyone the confidence to live and work safely and securely in the digital world.